One of the (many) joys of teaching kindergarten is reading wonderful books with kids. 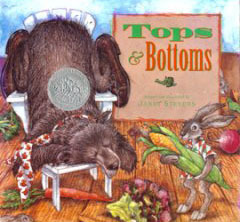 One of the books that we read this week was Tops and Bottoms. opening lines Once upon a time there lived a very lazy bear who had lots of money and lots of land. His father had been a hard worker and a smart business bear, and he had given all of his wealth to his son. But all Bear wanted to do was sleep. synopsis A Caldecott Honor Book. 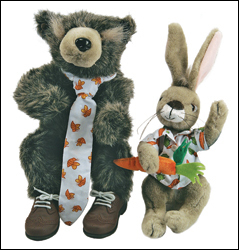 The story of clever Hare who grows a garden for lazy Bear every summer, splitting the produce. Even though Bear gets to choose whether he gets "tops" or "bottoms", or even "tops and bottoms" Hare ensures that he gets the best of the deal. After three summers, Bear decides to tend his own fields rather than go into business with Hare. I like this book because ... The story is a wonderful read aloud with lots of opportunity for predicting, discussing vegetable growth and discussing character development. At the end of the story, one of my kindergarten kidlets asked "who was the bad guy?" There were advocates for both Hare and Bear being the "bad guy", and then one student asked "does there have to be a bad guy - I think they are both good and bad". Pretty deep for a bunch of 5 year olds. Even better than the story (which is wonderful) are the illustrations. We loved the ways that Bear sprawls himself on his chair while he sleeps his summers away as well as his facial expressions when he realizes that Hare has tricked him. To add icing to the cake, the book reads from top to bottom rather than side to side. Tops and Bottoms lends itself easily to learning about plants. Growing beans in a cd case is a great way to see both tops and bottoms. We planted pumpkin seeds a couple of weeks ago; the tops are growing well and the bottoms are beginning to peek out the bottom of their containers. 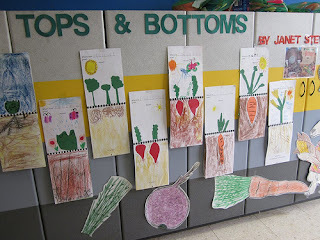 Michelle at Hubbard's Cupboard has a free sight word book about veggies growing in the garden. Michelle at Apples and ABCs (must be a Michelle thing!) 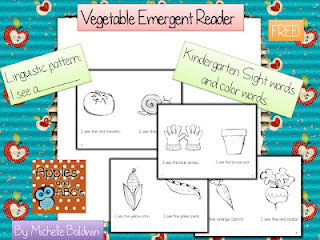 also has a free veggie emergent reader. 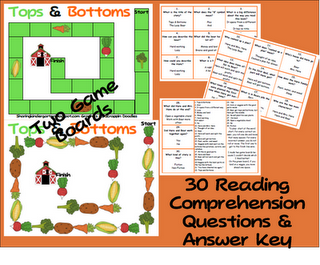 Mary at Sharing Kindergarten is selling a Tops and Bottoms mini unit which includes a couple of board games for @2.00. Little Miss Glamour and Mrs. Borden's Pre K 4 Class (in Shanghai) made Tops and Bottoms bulletin boards. 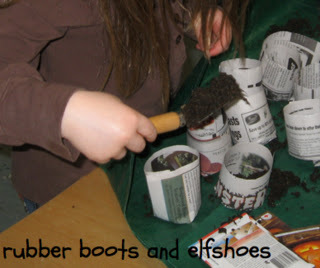 A garden sensory bin can continue the story inside on a rainy day. And, just 'cause they're super cute - available at The Library Store. For other perfect picture books, check out Susan Leonard Hill's blog and her Perfect Picture Books page. What wonderful activities! Your students are lucky! The book sounds like one I would love. Thanks for adding it. Welcome to PPB Friday. Glad you are reviewing. What a great book to read with kids. Amazing that at age 5-6 they could discern there were both good and bad aspects to the characters! 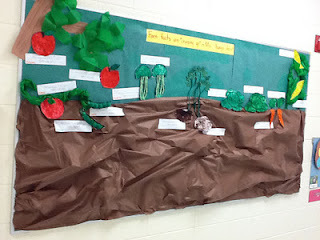 Loved the Tops and Bottoms bulletin boards! Great addition. Sandi, how wonderful to meet you via PPBF! This is a wonderful recommendation, however I am even more impressed by your fantastic activities. I'll have to borrow some for my preschoolers. Sounds cute. I love those bulletin boards. Just registered my daughter for Kindergarten today. She's so excited, but alas must wait until August. Hello there Sandi, I haven't heard of this Caldecott-Honor book yet, it sounds very interesting with a storyline that would keep a lot of little tykes glued to their seats. The illustrations look beautiful too. 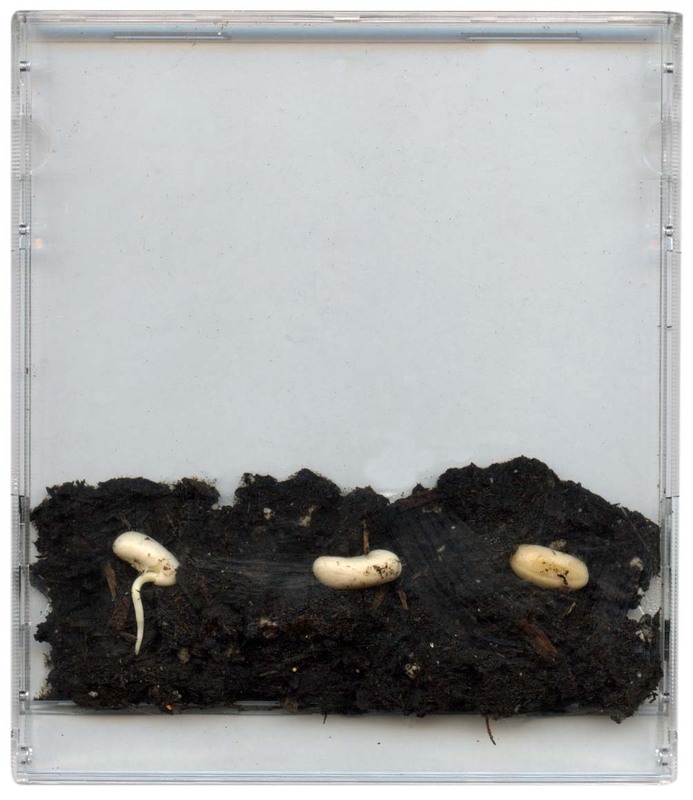 You have also given a fantastic list of resource here, how wonderful. Thank you for sharing all this. Thank you ladies for the warm welcome to PPBF. The archives are a fabulous resource - spent a couple happy hours last night reading about some known and loved books and some books that were brand new to me. So lovely to connect with you...I taught kindergarten for many years...and working with young children is still my passion! I love this choice for PPBF...and your activities and resources are fantastic! Sandi, I love your list of activities and resources. Now to find the time to check out those blogs. Glad you are doing PPBF.